Bhakti Yoga is connection to the divine using mantras, kirtan, & sacred stories. The philosophy is rich, ancient and powerful. It is the path of yoga following the heart For this special training Raghu has mined the depths of the 6 pillars of the Bhakti philosophy - ideas that have radical and instant transformational effects when applied in our daily lives. We will discuss these pillars and whole-heartedly experiment with them. We will then explore Vedic lore, mantras and their meanings, asana, mudras, setting up a home or studio altar, & japa meditation. Most of all Raghu will expertly explain how to weave all of these teachings into the fabric of our day-to-day lives. He calls this process: LEARN IT. LIVE IT. GIVE IT. Learn to create boundaries between toxic elements of your life and and how to add the good habits and practices that make ones journey rich and joyful! Both Days will include dynamic vinyasa yoga peppered with yoga philosophy, call and response chanting and pranayama suitable for all levels. Raghunath has been studying this sacred literature and applying to his life and his teachings for the last 30 years. He left for sacred Indiai his twenties to live as a monk for 6.5 years. 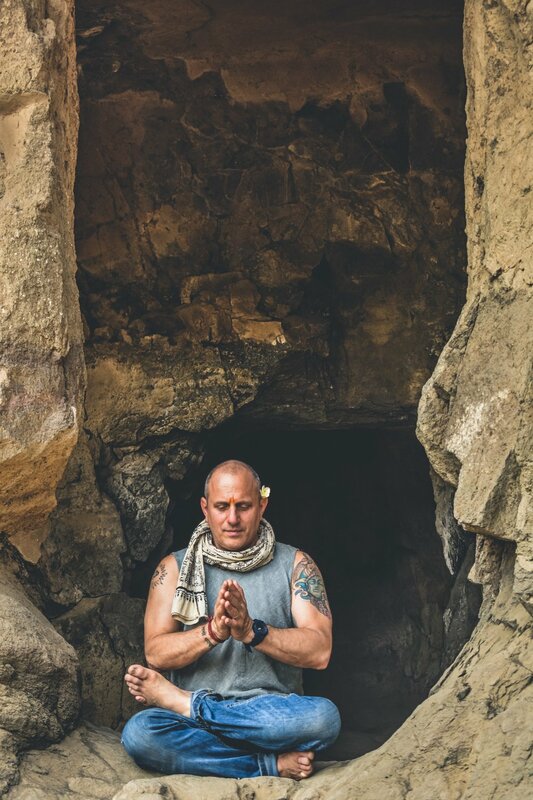 Now, decades later he has his own school, Supersoul Farm in upstate NY where he lives with his family and leads yoga teacher trainings,weekend immersions, kirtan workshops and sacred study on the interconnection of body mind & spirit. This course is especially for students and teachers who want to get a richer understanding of the profound jewels of yogic wisdom and adopt practices of bhakti yoga into their life and their offerings. Raghunath start each session with teach an invigorating all levels asana class accompanied by yogic breathing and call and response chanting to clear the mind and fine tune the body.